Yesterday, the day before Good Friday, I sat down to watch a documentary with my youngest son and daughter. It was called "The True Easter Story". It's part of a video DVD series from Focus On The Family called That The World May Know. The series is filmed in Israel and it's narrated by a great historian and Bible teacher, Ray Vander Laan. An excellent series if you want to know more about Bible times, traditions, culture, etc. 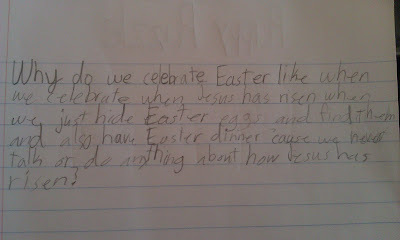 In my Baby Girl's own words... "Why do we celebrate Easter like when we celebrate when Jesus has risen when we just hide Easter eggs and find them and also have Easter dinner cause we never talk or do anything about how Jesus has risen?" This came as a surprise to me. I thought I was going to be the adult in the conversation. Instead it was my Baby Girl asking "Why do we have baskets? ", "Why do we color eggs? ", "Why is there a bunny?". 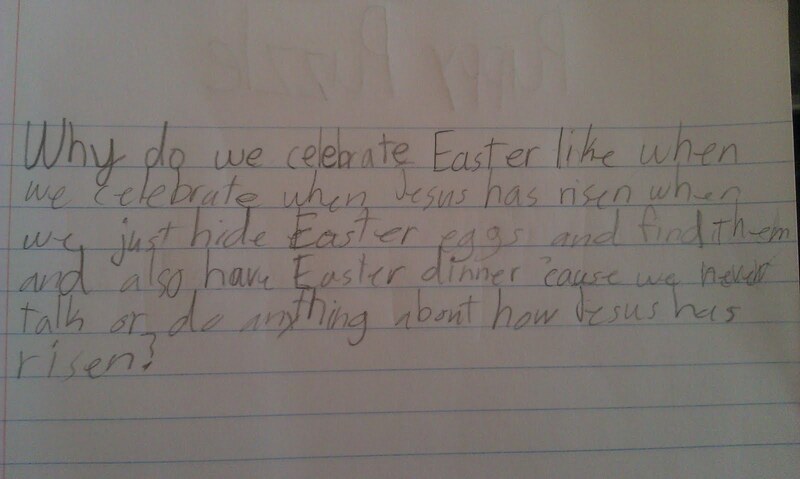 And mostly she kept asking "Why don't we do anything to celebrate Jesus if that's what Easter is about?" Imagine my surprise (again) when I couldn't think of anything to say! I told her we go to church to celebrate Jesus and that's why we have Easter dinner to celebrate with family. But as I began to think even more, I realized we do those things anyway. What DO we do to celebrate Jesus being risen from the dead? She suggested that we read the real Easter story from the Bible each night until Sunday. I think that's a good idea. We will be sure to do that. We were following the Holy Week a little more closely this year, which kept the kids interested. And I will be sure to make a point of talking about Jesus and how He laid His life down for us... and took it up again. God Answers Prayer... And Sometimes Really Fast! Got Email From 'Kathy Lagoli'?... it's SPAM! Kite Flying... It's A Breeze!